Me gusta tacos! This meal is perfect for health conscious awesome people like yourself who want to quickly put a meal on the table. This entire meal took less than 30 minutes (45 if you make a more difficult side dish) to make, so don’t let the ingredient list fool you, it’s mostly just dried spices. And, if you have a set of extra hands, it will take you even less time. Garnish: avocado, salsa, black olives, mango salsa, guacamole, etc. 1. Brown the meat in a skillet and drain the fat. Add all of the spices, cilantro, scallions, chives, lime and water to the skillet and simmer for 10 minutes, stirring occasionally. 2. While the beef is browning, throw together your side. I made a salad of chopped zucchini that I let sweat and patted dry (learn how here), chopped red bell pepper, avocado and Whole Foods mango salsa (for a homemade recipe, try this). Rinse and pat dry the butter leaf lettuce so it is ready to go. 3. 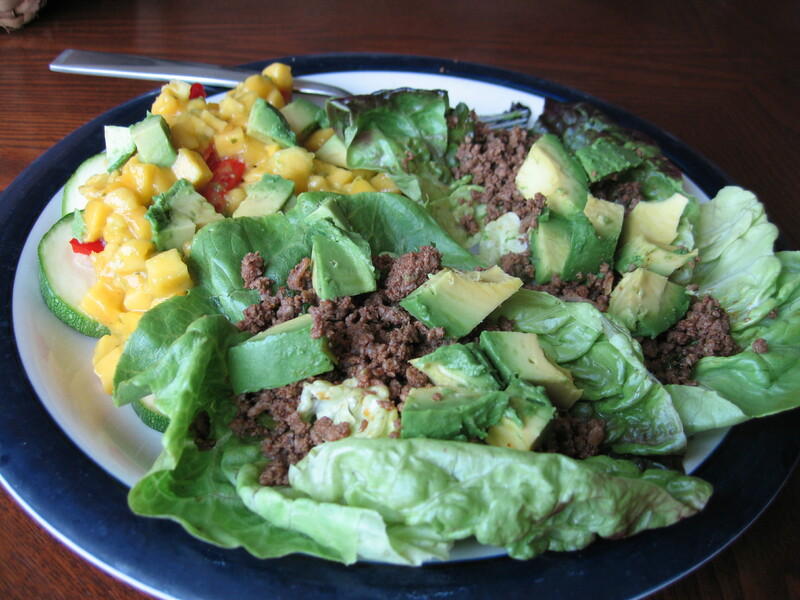 Layer the ends of two butter lettuce leaves and fill with the taco meat and any garnishments you like. 4. Enjoy with friends, family or in solitary peace on your porch. 1. Pre-heat oven to 400°. Clean vegetables, place tomatoes in a large glass mixing bowl (after patting them dry) and set aside the remainder of the vegetables. 2. Fill large stock pot with 1 inch of water and place metal steamer inside. Bring water to a boil. While water is boiling, cut asparagus in half and chop snow peas’ tops off. Place in pot and steam for 6 minutes. Remove and place in an ice bath or run under cold water. Pat dry and place in mixing bowl. 3. While asparagus and snow peas are steaming, mince the chives and chop the scallions, placing them in the bowl. 4. Using a mandoline, slice the zucchinis in 1/8 inch thick rounds. Place in a separate mixing bowl and mix with 1 tsp sea salt. Let them sweat for 10 minutes. Pat dry and place in large mixing bowl with the other vegetables. 5. 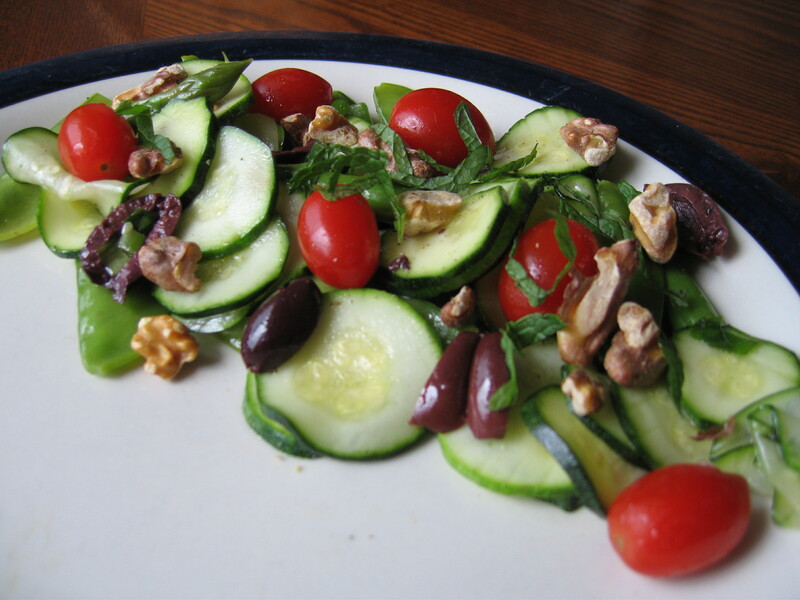 While zucchinis are sweating, place walnuts on a baking sheet and toast for 8 minutes. Then, cut kalamata olives in half and add to the mixing bowl. 6. Add olive oil and black pepper to the bowl. Mix well. 7. Serve garnished with toasted walnuts and ribbon-sliced mint.